I am a modern design lover by heart and am always wanted to be on style all the time not only on my dress but also at home. I wanted my home to be dressed fashionably that is why I am always searching for trendy and fashionable household furniture and accessories. Lighting is one of the things that I focused to have now, because it gives my home a warm and classy atmosphere. Chandeliers are some of the known home lighting especially in the living and dining areas. While I am in my search for a beautiful and elegant pendant light for my newly renovated home, I find this very minimalistic and elegant mini pendant by George Kovacs. It is super classy and easy to install. In addition to that, the P445-4B-077 mini pendant of George Kovacs has a Chrome finish that shimmers brightly and its black gloss ceramic with opal glass shade is just so perfect to my black and white house theme. 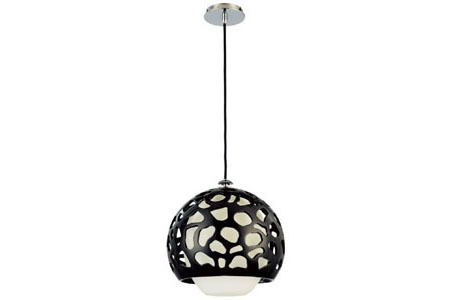 However, P445-4B-077 mini pendant’s color is a very good match to any house color theme. I am so happy that I have bought this pendant lamp because this is the first lamp that I have seen with an artistic covering. It does not just serves as an art of the lamp, but also serves as a protection of the shade from being hit with a hard object, which is very prone at home, for I have kids below five years old. I love its minimalistic design, for it made the pendant lamp suitable to any areas of the house. You may place it in your living room, in your kitchen as an under cabinet lighting, in your bedroom, and even as a bathroom lighting, the P445-4B-077 Mini Pendant has the ability to give you a wonderful glow. In addition, the price that the P445-4B-077 has at 26 percent off, its really a great buy considering the product’s elegant design and multi-purpose function as a pendant lamp and an interior design as well. You better hurry and get one now, because with me, I have nothing to complain with my elegant P445-4B-077 mini pendant by George Kovacs. Illuminated bath screen is designed by Jonah Oad can add a distinct style in your bathroom. This big screen panel surely can brighten your bathroom in a unique way, surely can fit your futuristic or modern bathroom design. Elegant and textural, the Loft + Bath Series from ZOLi uses wood, glass, concrete, stainless steel, porcelain, leather and brass to create memorable pieces with thoughtful touches. With options ranging from a stainless-steel sink with a leather-wrapped cabinet to a concrete basin matched with a contemporary wood vanity, the collection offers something for everyone. The series encompasses 10 main collections that include washbasins and bowls, independent cabinets, mirrors and medicine cabinets, lighting and accessories. If you want to create modern atmosphere in your bathroom, adding this bathroom light can increase your futuristic bathroom designs. Take a look at this beautiful titanium bath vanity finished in brushed steel with frosted glass. Bathroom light is also one of important parts of bathroom, pay attention to this one.